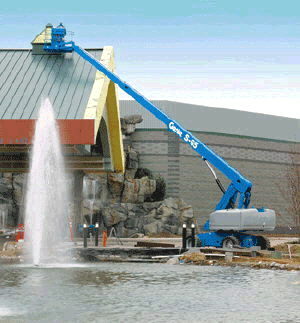 The Genie S 65 Telescopic Boom man lift offers greater horizontal outreach than any other type of aerial platform perfect for areas with limited access in construction and industrial applications. Self-leveling platform with hydraulic platform rotation. * Please call us for any questions on our genie s 65 man lift rentals in Durango CO, LaPlata County, Mancos, Ignacio, Cortez, Bayfield, Pagosa Springs, and Silverton CO.